An official-looking letter asks you to pay $83 to verify information about your real estate property. This is a scam. County authorities have all the information they need, and would never ask you for money to verify information. People went to file income tax, and were told their return had already been filed. If this happens to you, Sheriff’s office has forms to fill out to notify the proper people to get this corrected. Medicare/Medicaid – people pose as government representatives and ask for personal information. Don’t give out anything! Counterfeit prescription drug scam – someone contacts you about discounted rates on drugs. Stay away from that. Fake accident ploy – con artist poses as grandchild who needs money wired because they’re in trouble or had an accident. If you get a call, verify; call the person or the parent. 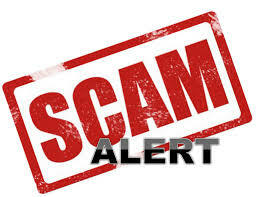 If you have questions, or want to report a scam, contact the Richmond County Sheriff’s office: 804-333-3611.